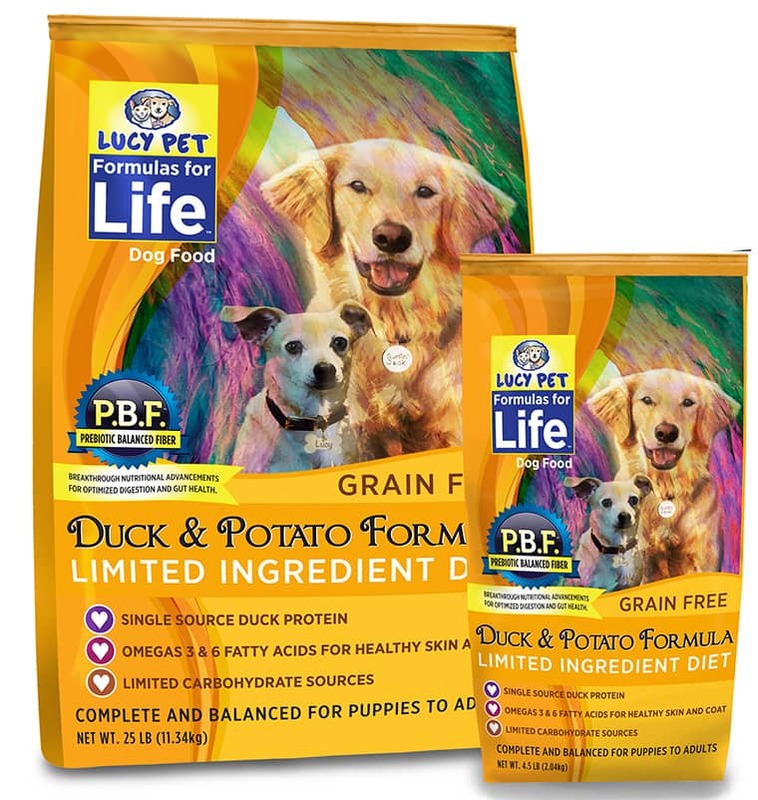 Lucy Pet Duck and Potato Grain Free Limited Ingredient Diet Formula™ features our advanced P.B.F. Prebiotic Balanced Fiber™ to produce an optimal environment in the digestive tract to lead to an optimal balance in the gut. 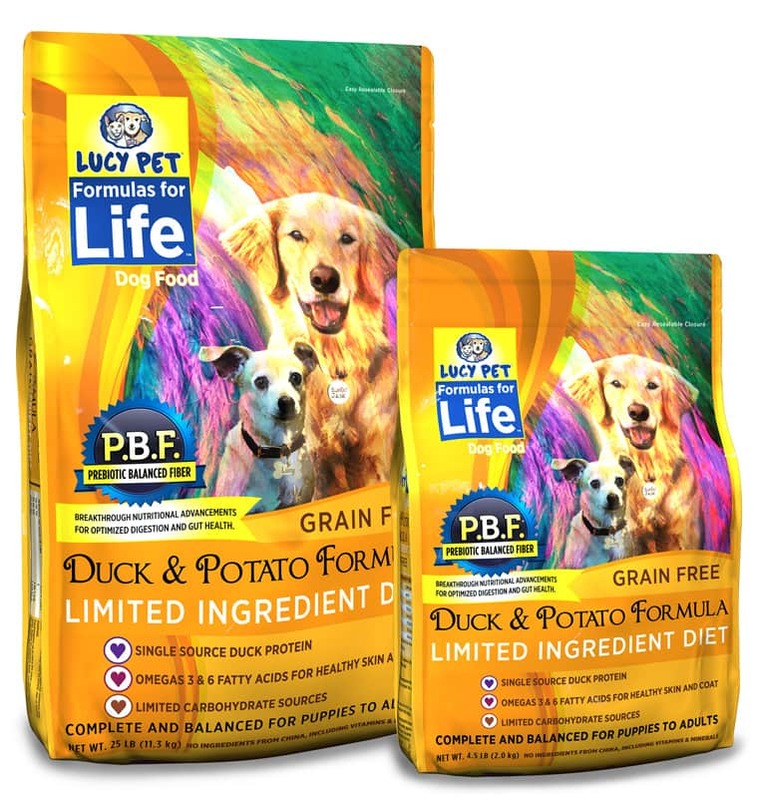 This Limited Ingredient Diet is made with a single source duck protein and limited carbohydrate sources. 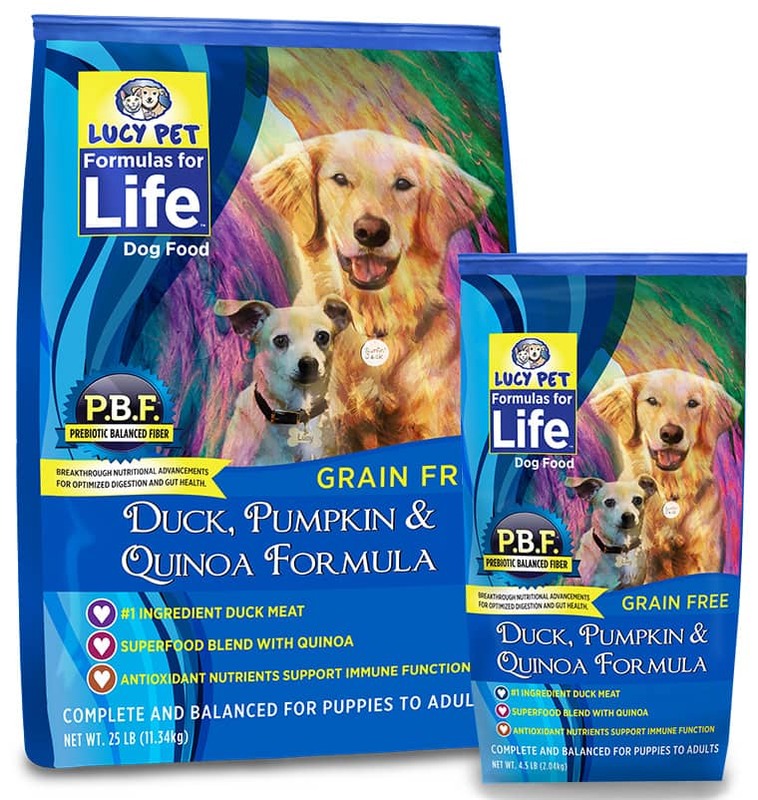 Grain-Free, Limited Ingredient Diets can be an excellent choice for dogs with food sensitivities. The number one ingredient is duck meat from France and USA, with absolutely no duck by-products. A blend of potatoes and sweet potatoes made from premium quality whole fresh potatoes from the EU and whole sweet potatoes from the USA. These grain-free carbohydrate sources supply sustained energy. 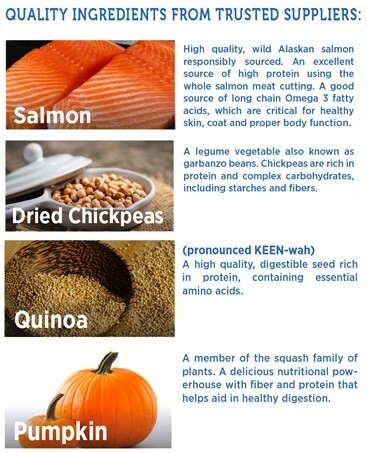 A good source of dietary fiber, vitamins, and minerals. This formula includes a superfood blend of ingredients naturally preserved. No ingredients from China, including vitamins and minerals. A variety of blended high-quality fiber sources, including potatoes, sweet potatoes, flaxseed, dried kelp, dried chicory root, pumpkin, and ground miscanthus grass. 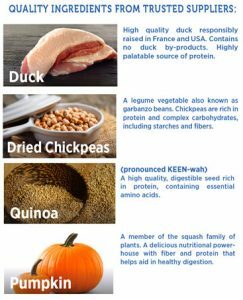 Having a diverse population of fiber provides nourishment for the gut bacteria, which in turn nourishes the entire body. 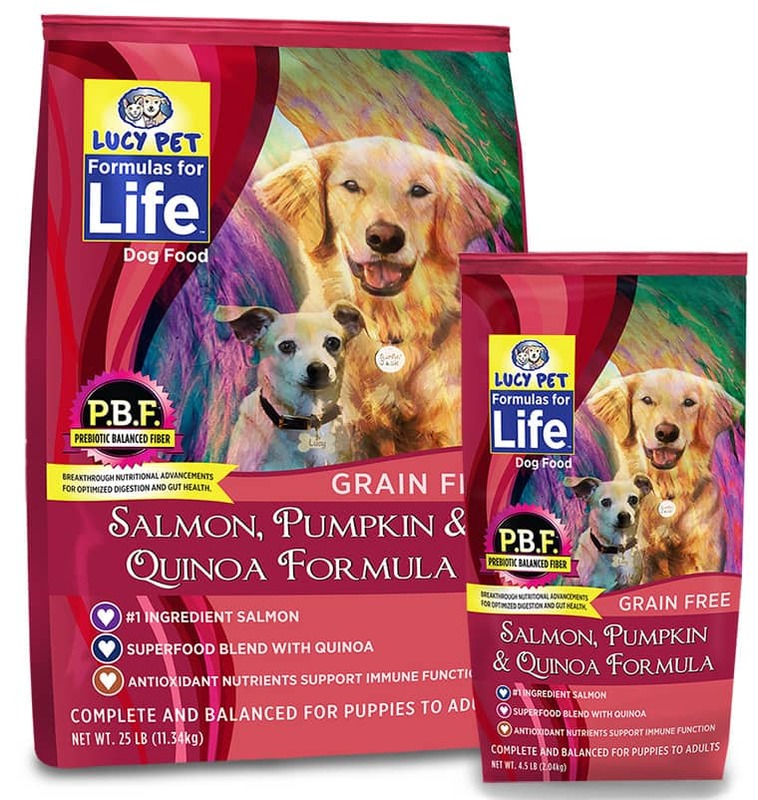 We guarantee Omega-3 Fatty Acid levels from natural ingredients including flaxseed, duck fat and Vitamin E.
Lucy Pet Salmon, Pumpkin, and Quinoa Grain-Free Formula features our advanced P.B.F. Prebiotic Balanced Fiber (TM) to produce an optimal environment in the digestive tract to lead to an optimal balance in the gut. The P.B.F. 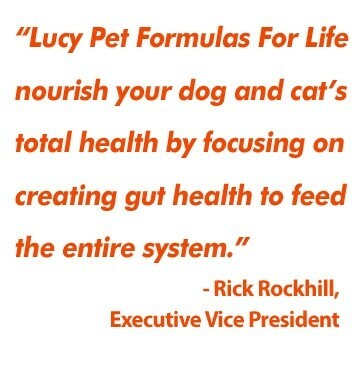 formulation is based on 40 years of research and studies by Dr. George C Fahey. The number one ingredient is Wild Alaskan Salmon. 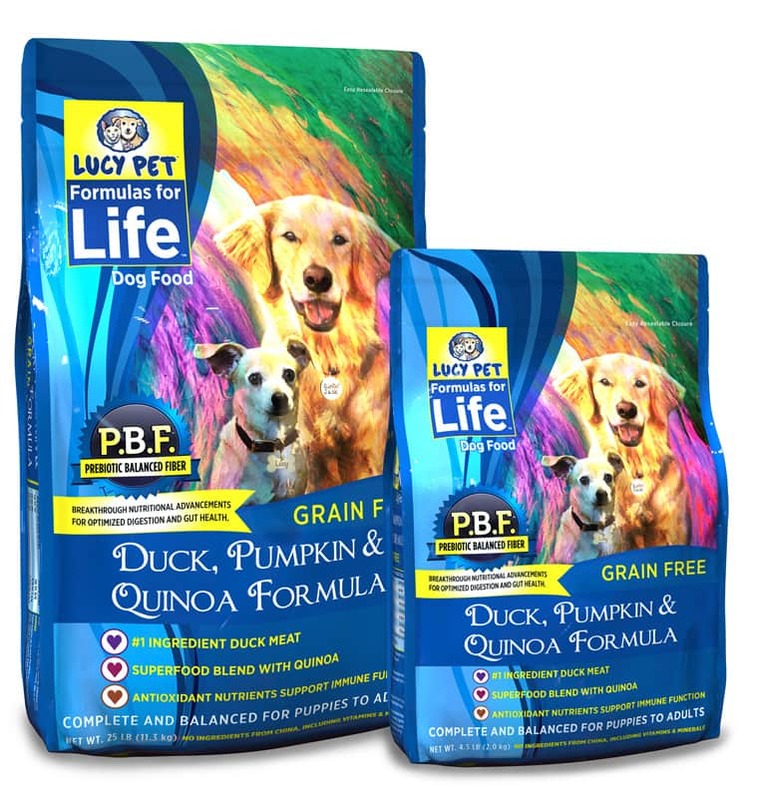 Includes chicken meal from the USA, chickpeas (rich in protein and complex carbohydrates, including starches and fibers), delicious pumpkin (a nutritional powerhouse with fiber and protein that helps aid in healthy digestion), and quinoa, (a high quality, digestible seed rich in protein, containing essential amino acids). This formula includes a superfood blend of ingredients naturally preserved. No ingredients from China, including vitamins and minerals. 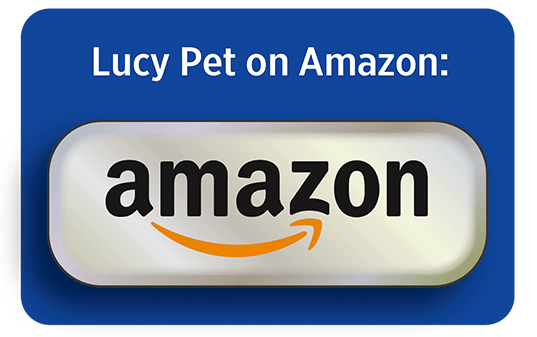 High-quality Wild Alaskan Salmon oil plus varied carbohydrate sources for energy. 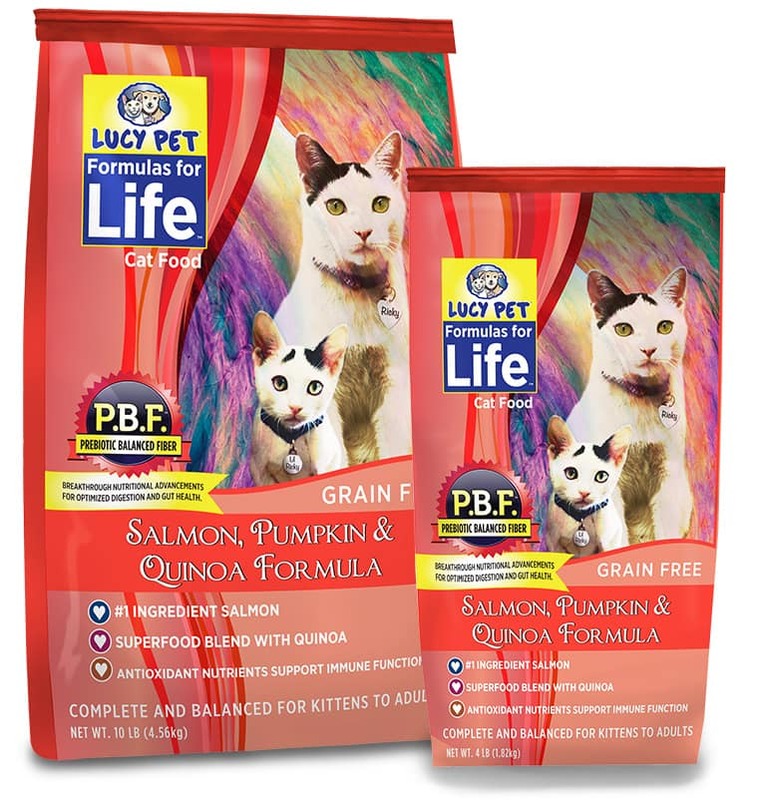 We use high-quality proteins from Salmon and Chicken Meal from the USA, with no chicken by-products, and no artificial flavors, Pumpkin and added chicken fat adds to a delicious taste. 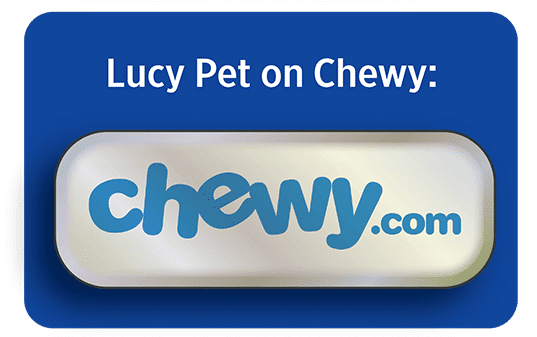 We use high-quality proteins from Salmon and Chicken Meal from the USA, no chicken by-products, and no artificial flavors. Pumpkin and added chicken fat adds to a delicious taste.